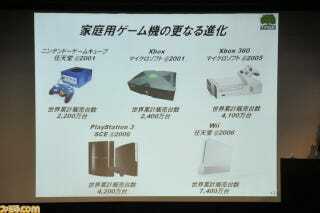 At a presentation in Kyoto, Japanese developer Tose, best known for its Nintendo games, claimed the PS3 is outselling the Xbox 360 worldwide. The company is now apologizing for that. Oh, the shame! According to Tose's original data, the Xbox 360 has sold 41 million consoles worldwide, while the PS3 has sold 42 million. If that data was correct, then it would mean Sony is winning the "console war". The data, however, is not correct — something that was pointed out to Tose. "There was an error in one of the slides used in the presentation," Tose stated today in an official release, adding that it was "truly sorry" for any trouble the mistake caused. Moving forward, the company aims to be more careful and prudent with information it makes public. The gap between the consoles is closing. The Xbox 360 apparently clocks in at 44.6 million units sold worldwide, and the PS3 clocks in at 41.6 million.